To describe The Lobster as a bit of a strange film would be the understatement of the year. There’s no doubt that the eccentricities in Greek filmmaker Yorgos Lanthimos’s English-language debut are what’s running it – think Paul Thomas Anderson by way of Wes Anderson, Lars Von Trier and The Island of Doctor Moreau, and you have a semi-clear vision – but they are also the type where confusion is bound to settle in, and leave us experiencing a joke that doesn’t necessarily have a formidable punchline. In this strange world – signified by the opening scene of an unknown woman driving along a country road and then shooting a donkey to death, as you do – singletons are forced to check in to a hotel where they are given a limited amount of time to find a suitable partner, or be transformed into an animal of their choosing. One such man, David (a portly Colin Farrell), arrives in tow with a dog (revealed to be his own brother) and experiences the stern and harsh facilities that are designed to, according to the hotel manager (Olivia Colman), psychologically prepare its guests for life as an animal. Masturbation, for example, is strictly forbidden, and punishment includes having your fingers burned in a toaster, as experienced by John C. Reilly’s lisping man when he is caught with a photo of a naked woman on a horse (Colman’s manager thinks he should have been pleasuring himself to the horse instead). Understandably, David soon cannot take much more of this, so he escapes into the forest to live amongst the “Loners”, led by Léa Seydoux, where the rules and conditions are just as cruel as the hotel, if not more so. Romance of any kind is strictly forbidden between Loners, so imagine the difficulties when David soon falls in love with a fellow Loner (Rachel Weisz). It’s clear that Lanthimos has a desire to say something with this increasingly bizarre premise, particularly about the difficult nature of love and how one can feel ostracised when they either have it or don’t have it. He inserts Orwellian satire consistently into several scenes, with the feeling of social incarceration being felt left and right no matter where we turn (in a mall, security can come up and intimidate you if you are simply standing alone), and the idea of finding a partner being a matter of life or death, in a sense, is an interesting concept that speaks volumes about modern totalitarianism and adhering to normality or else be shunned for it. The fact that it’s all surrounding something as simple as falling in love, a trait that does not come around naturally to as many people as it does, also offers a creepy subtext of forced companionship in a state of supposed free will, something akin to when women in Nazi Germany were heavily encouraged to reproduce frantically and produce more soldiers to fill up the Third Reich. There’s clearly plenty to be said here, and for the most part Lanthimos suggests a good load of this stuff in a subtle and uncompromising way. It’s admirable, certainly, but for us there was a certain annoyance with how it was all being told. Whether or not you find the material at all fascinating, Lanthimos’ directorial style is going to be instantly divisive. A lot of the dialogue, and its delivery by its cast of talented actors, is rather awkward, as if it were made up by an ensemble of cyborgs that are programmed to say these lines with little to no oomph. It ties in nicely to the deadpan humour that is placed throughout, but the flat delivery can be irksome sometimes and extremely irritating when you’re more interested in what some of the motivations are behind certain characters (a particularly heartless woman, played by Lanthimos regular Angeliki Papoulia, has a habit of being cold and nasty but we never understand why; and Seydoux’s character is so anti-love for reasons we desperately want to understand but are never given opportunities to do so). 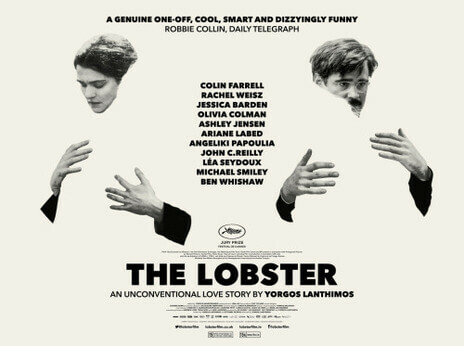 There’s definitely a lot to admire about The Lobster, especially in what type of discussions it’s willing to have about the nature of love and what society expects out of it, but for us it was an overall difficult film to become attached to due to the overly-bizarre nature of Lanthimos’ particular divisive style. It’s an interesting flick, certainly, but just not our kind of flick. The Lobster offers intriguing social satire that calls back to Orwell’s ideals of a totalitarian society in a modern age, but Yorgos Lanthimos’ overly-bizarre directorial style tends to irritate more than it does fascinate.